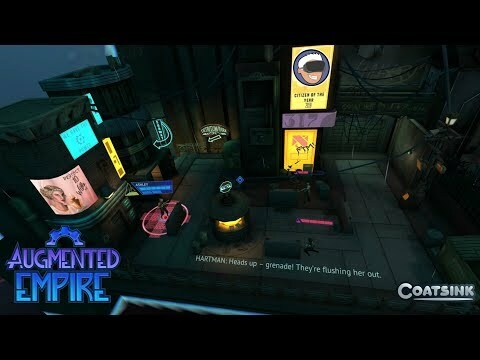 Today on Lunchtime with my Gear VR I am taking a look at Augmented Empire by Coatsink who are the developers behind other great VR titles such as the Esper Series and Gang Beasts. Augmented Empire is a story-driven tactical RPG set on the island of New Savannah, an isolated neo-noir city divided into three tiers by the ‘Citizen Grade System.’ While the citizens deemed of high societal value live in luxury at the summit, outliers and criminals are forced to live in squalor at the island’s depths. From the armchair of their secluded hideout, players use simple look-and-click controls to instruct their team of 6 augmented misfits. This is presented as a world rendered in an ‘augmented reality’ diorama. Overall I was very impressed with the gameplay style as well as the graphics and sound. The voice acting in Augmented Empire is also especially good as it features the talents of actors such as Kate Mulgrew (Star Trek Voyager), Nick Frost (Shaun of the Dead, Hot Fuzz), Doug Cockle (The Witcher series), and Garrick Hagon (Star Wars: Episode IV - A New Hope, Horizon: Zero Dawn). All I can say is that if you own a Gear VR and miss the days of the classic turn based RPG's then this is one you won't want to miss! I think I needs this.. Yes! This brings back the original Fallout games (1 & 2), which I always preferred over the FPS follow up versions. I even like how this game takes in to account the distance between you and your enemy (higher chance to miss the further away). It makes it that much more rewarding if you find a long-range weapon (e.g. sniper rifle). Great stuff. I don't yet own the Gear VR but I plan on getting one soon. Although I would really love to play this in my Rift! Yes! This brings back the original Fallout games (1 & 2), which I always preferred over the FPS follow up version. I even like how this game takes in to account the distance between you and your enemy (higher chance to miss the farther away). It makes it that much more rewarding if you find a long-range weapon (e.g. sniper rifle). Great stuff. I don't yet own the Gear VR but I plan on getting one soon. Although I would also love to play this in my Rift! Yeah this really needs to come to the Rift as well! With the positional tracking it would feel complete... I was sorely missing the ability to lean in for a closer look at the action. I really hope Coatsink decides to port it over. Hello, everyone! I am new here and became a little bit lost. Wish to learn more about VR and Augmented Reality. I understand the basics of it but not sure how does it work in details? My friend is doing research about AR for her project. I wish to help her as well. Where shall I start? I understand that VR and AR play a vital role in marketing, games etc. Are there any other fields where VR and AR are or will be important in the future? What area wouldn't vr and ar be important? Simple AR things like HUDs that can be incorporated into glasses will replace phones. hmm, sounds interesting. Do you think it will happen soon? Weekend sale! Augmented Empire is 50% off. Also, Krypt Crawler is on sale too. That's an excellent value for both of these titles as they each take around 5 hours to complete.